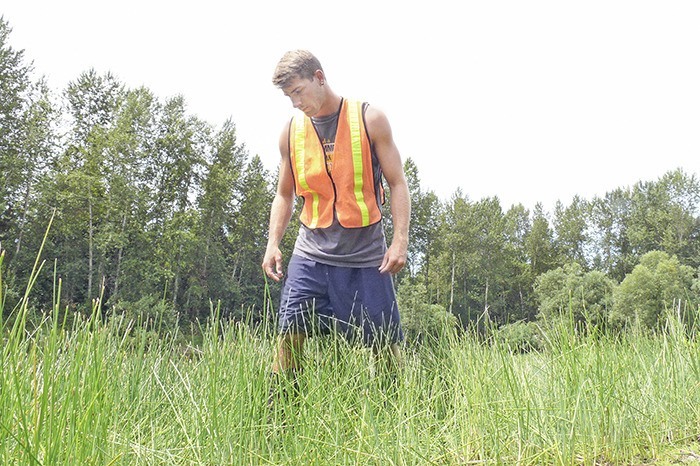 Curtis Abney searches for signs of Western Toads breeding site in a former gravel pit in South Langley. As Curtis Abney works his way through the thick brush that surrounds a former gravel pit in South Langley, dried-out leaves and branches crunch and snap beneath his boots. Normally at this time of year, the ground would be damp and tiny newborn toadlets — thousands of them — would be scurrying through the mud. But the fierce summer heat has parched the place, water levels are lower than normal and there are few newly-hatched toads to be found. The woods open into a clearing, revealing a small lagoon that is a breeding site for the Western Toad, a vulnerable “blue-listed” species of amphibian. A Rocha believes the former gravel pit near 18 Avenue and 196 Street is the only confirmed Western Toad breeding site in the Campbell River watershed, and would like to see it protected from development. On July 6, Abney appeared before Langley Township council to argue for preservation of the site as ecological wetlands. He was part of an delegation representing A Rocha and the Little Campbell River Watershed Society. The presentation recommended turning the site, which is currently split between six private properties, into parkland. A Rocha suggested keeping large rural lot sizes around the lagoon, to “retain and re-establish” native vegetation, encourage continued monitoring of the toad population and water quality and work with Metro Vancouver and neighbouring Surrey to protect wetlands and migration corridors. In Oregon, a similar strategy was successfully used to help a struggling population of Western toads rebound, Abney said. The breeding site in Brookswood/Fernridge was discovered three years ago, when a resident of the area called A Rocha to report a massive migration of toads that was blocking their driveway. “The cause of these declines remains unclear; breeding sites/populations may be rare and relatively isolated, toads may not adjust well to rural and urban development, and the species may be particularly susceptible to disease,” the centre says.